Master Moves Mickey has taken the bloggosphere by storm and it won’t be long until your little ones will want to wiggle and giggle with Disney’s oldest character. 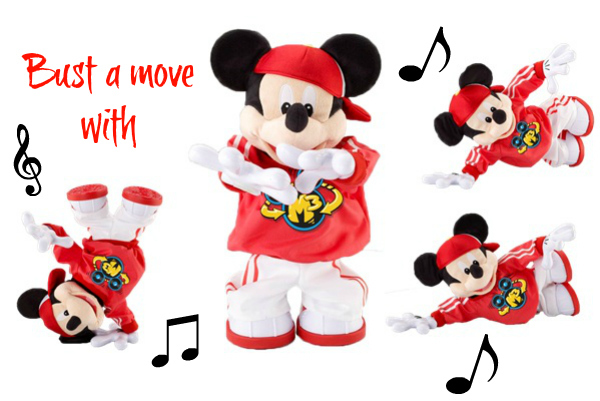 There’s no need to worry though: Despite his age, Master Moves Mickey can bust moves that will make you green with envy and in time for Christmas he is taking it to a whole new level. Master Moves Mickey has 15 moves and 8 original songs and comes with plenty of humour and interactive dances to get the whole family up and dancing! Amy doesn’t have a Master Moves Mickey herself, but having seen her dance along to the video of bloggers’ little ones makes me seriously consider writing it on her Christmas list. It’s just too cute! If you already have a Master Moves Mickey at home or you are thinking of asking Father Christmas, then make sure to film your little ones and Mickey busting a move. It’s not only a fun video to keep, but it can also win you a fab £1000 and a toy bundle, if you upload your mini-movie to the official Master Moves Mickey website. For more information, you can also visit Mattel’s Facebook page or follow them on Twitter. Disclosure: This is a sponsored post on behalf of Mattel.